A dachshund can still give a squirrel or a chipmunk a run for their money and have a great time digging holes, one thing your family might not care for. Of course if you don’t have time to tend to a dog or won’t be home a lot the “bored and lonely dachsies often misbehave.” Before you even decide to purchase a dachsie, this book will tell you many things you’ll have to think about because although this is an appealing dog, it may not fit in with your family’s lifestyle. In these pages you’ll learn about their exercise needs, how difficult they are to train, you’ll learn about their sensitive physical structure, a list of supplies you’ll need, the need for proper veterinarian care, safety concerns for the breed, the type of food you’ll need and basic care. When any youngster reads about this spirited dog, there is no doubt they will fall in love with the breed. 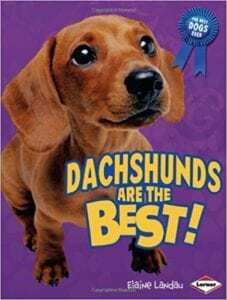 This book was well researched and written and is an excellent introduction to the dachshund. Of course if you are going to consider purchasing one you will need a more detailed book specific to the breed. There are numerous photographs scattered throughout the book. In the back of the book you’ll find an index, a glossary, and additional recommended book and website resources. Small captions and sidebars offer up many interesting vignettes about the breed. For example, you will learn about some “rich and famous” people who have owned them. Quill says: I’m sure you'll agree that ARF, ARF...dachshunds are the best!